There are some old familiar faces but perhaps not the ones that grab all the media hype which tends to surround Christmas advertising these days. It is worth noting that a number of the best performers, including three of our top five, tie their campaigns into their wider year, long campaigns, delivering a dose of festive punch as well re-enforcing and delivering for the wider brand. In top spot is Cadbury (Fallon London), it might now be American owned but this old British favourite has struck gold (or should I say purple?) 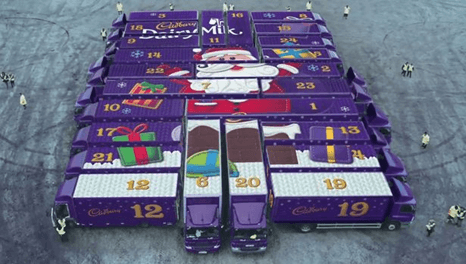 with an advent calendar inspired story showing the Cadbury production machine distributing their own contribution to the festive season throughout the UK. The unmistakable Cadbury Purple is blazened throughout the ad, backed by the booming Thunderbirds theme tune giving it that typical Cadburys feel good factor, fitting with the overall distinctive Joyville campaign and standout amongst the competition. Perhaps, or perhaps not a surprise 2nd place is Argos with their high energy “Just Can’t Wait” (CHI and partners) campaign. Stunning visuals, high pace, and with a sense of humour make this one of the most actively engaging executions of the Xmas period. The advert is distinctly Christmas, but fits with the wider branding, meaning that it ensured that consumers knew that it was for Argos. Some humorous product integration coupled with a simple call to action also making this one of the most motivating ads this year. Everybody loves a heart-warming story at Xmas and in 3rd spot Sainsburys have delivered exactly that with the story of Mogs Christmas Calamity (AMV BDDO). Last year the Supermarket giant gave us a war time epic tear jerker whereas this year we are touched with a story of a family cat brining a house to it’s knees at Christmas only for the kindness of the neighbours to save the day. The ad is perceived to be very different than other Xmas ads as well as being highly enjoyable and engaging showing that the art of storytelling in advertising is alive and kicking. Alongside “Mog” in our rankings is an old classic, just as we all still love Slade & Wizard, you only have to mention “holidays are coming, holidays are coming” and the less cynical of us out there will raise a smile. Coke’s classic feel good Christmas truck fest remains a firm favourite, what is there to say that hasn’t been already said, yes it’s cheesy, but come on, admit it, it makes you feel Christmassy, and Christmas just wouldn’t be the same without it. The final member of our top 5 Christmas ads for 2015 is another juggernaut but this time it’s a German one in the form of the seemingly unstoppable Aldi. The German discounter continues to take market share and is also delivering in the advertising department. A pretty traditional Xmas ad backed by the Sound of Music’s “A few of my favourite things” making it highly enjoyable, coupled with some high quality produce making it the most persuasive ad in our list. So, where are Christmas kings John Lewis? Sitting just outside our top 5 with “Man on the Moon” (Adam & Eve DBB) it would seem. That doesn’t mean it’s all doom and gloom for our man on the moon, it’s still a highly enjoyable ad and like Mog, it is seen to be very different and is unique at pulling at the heart strings, beating all others in its wake on its ability to make you cry. However, it doesn’t grab consumers attention as much as some of the other executions, perhaps the stripped down cover version with a vulnerable vocal has become too predictable? Or that fact it is competing with a fairly sombre and dark coloured ad, against a plethora of gung Ho festivity and bright colours? To Celeb or not to Celeb at Xmas? There is usually a healthy dose of celebrities sprinkled throughout Christmas advertising, be that a celebrity chef or a famous actor, actress or model. This year is no different, however, the celebs in question don’t seem to have hit the mark, Ruth Jones’ Tesco (BBH) family are pretty run of the mill and Myleene Klass playing the piano for Littlewoods (St Luke’s) is seen to be pretty boring, although that said, they did quite like the soundtrack. The biggest Christmas Turkey, this year is Hollywood A lister Geoff Goldblum, who did Currys/PC World (AMV BDDO) no favours. Now there is no denying he’s a fantastic actor, and delivers in the series of “spare the act” ads however they appear a bit too much like hard work for viewers, who find them dull, not particularly enjoyable and crucially don’t have a clue what brand is being advertised. So as we head into work Xmas party season, the teams at Fallon (Cadbury), CHI & Partners (Argos), and AMV/BBDO (Sainsburys) will have a few more bubbles in their glasses this year.